Major patches of plants with nectar-rich flowers provide important feeding stations for resident and migratory hummingbirds from the desert coast to the summit of the Sierra Madre Occidental. Low and high elevation habitats are used at different seasons by migrating hummingbirds. The spring migration route traverses lower, warmer elevations from desert to oak woodland. The early fall migration takes place along the high mountain corridor while the later fall migration follows river valleys. More information on this topic can be found in the Migratory Pollinators Program summary. Twelve species of hummingbirds were observed visiting 60 species of plants in the Yécora area (Van Devender et al. in press; Appendix 5), including a dozen cultivated and one introduced species. The number of hummingbird species observed visiting different plant species ranged from one to eleven species. 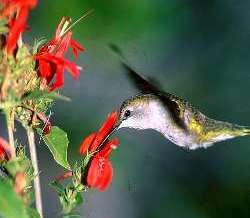 The most important floral resources were provided by nine species of plants that were visited by five or more hummingbird species. 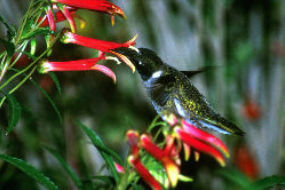 The plants most visited by hummingbirds were Texas betony with eleven and tree tobacco with ten species of hummingbirds. Six species of hummingbirds visited hierba del piojo, pineapple sage, and tree ocotillo while five species visited limita (Anisacanthus andersonii), Maycoba sage (Salvia betulaefolia, red flowers in summer-fall), tree morning glory, and wild jícama. Other red-flowered plants visited by hummingbirds in the Yécora area include bat-faced monkey flower (Cuphea llavea), cigarrito (Bouvardia ternifolia), honeysuckle (Lonicera pilosa), Indian paintbrush (Castilleja patriotica), a mallow (Kosteletzkya thurberi), red lobelia (Lobelia laxiflora), and scarlet morning glory (Ipomoea cristulata). In the spring tree ocotillo (Fouquieria macdougalii) is an important red-flowered food plant in foothills thornscrub along the Río Yaqui at 200 m elevation. The image is linked to a gallery of plants. Several red-flowered shrubs in the Acanthaceae (Anisacanthus andersonii, Justicia candicans, and Tetramerium abditum), the purple-flowered wild jícama (Ipomoea bracteata), and the white-flowered tree morning glory are (Ipomoea arborescens) are important hummingbird flowers in the tropical deciduous forest spring in Arroyo Los Huérigos (650 m elevation) and Rancho la Mula (900 m elevation). The image is linked to a gallery of plants. Hierba del piojo (Mandevilla foliosa) is an important yellow-flowered food plant in July-August at 1460 m elevation in oak woodland at Rancho La Palmita on the north slopes of Mesa del Campanero. Nearby at El Aguajito (1640 m elevation), pineapple sage (red flowers) and the exotic South American tree tobacco (yellow flowers) have flowers most of the year. 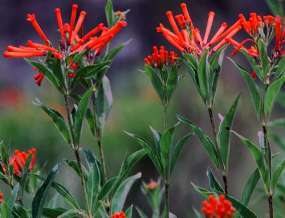 In September 2000 in Barranca El Salto (1900 to 2100 m elevation) on the western edge of Mesa del Campanero, a dense stand of the red-flowered Texas betony (Stachys coccinea) attracted 11 species of hummingbirds; only 16 are known for the entire state of Sonora (Russell and Monson 1998). The image is linked to a gallery of plants. Krebbs, K., Van Devender, T. R., and W. A. Calder. 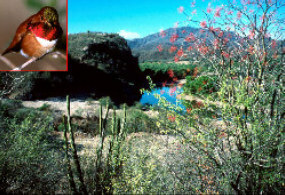 Distribution and diversity of hummingbirds the Sierra Madre Occidental of eastern Sonora, Mexico. in J.-L. E. Cartron, G. Ceballos, and R. S. Felger (eds. ), Biodiversity, Ecosystems, and Conservation in northern Mexico. Oxford University Press. Russell, S. M., and G. Monson. 1998. The Birds of Sonora, University of Arizona Press, Tucson. Van Devender, T. R., W. A. Calder, K. Krebbs, A. L. Reina G., Stephen M. Russell, and R. O. Russell. Hummingbird plants and potential nectar corridors for the rufous hummingbird in Sonora, Mexico in G. P. Nabhan (ed. ), Conservation of Migratory Pollinators and Their Nectar Corridors in North America, University of Arizona Press, Tucson.